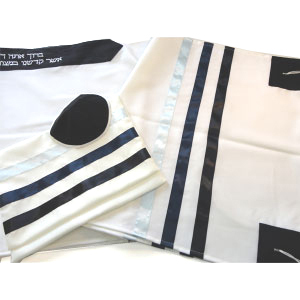 This Israeli-made tallis prayer shawl is woven of wool and decorated with three stripes on each side, radiating from light blue through to dark. While blue is a traditional color for this sort of judaica, the three-color motif adds a modern twist. Since time immemorial, Jewish people have worn fringed garments to both set them apart (what a wonderful anti-assimilationist tool tallit prayer shawls are) and to remember all 613 commandments. Galilee silks, a maker of fine judaica in Israel’s north, continues this timeless tradition by bringing you this multicolored woolen tallis. This shawl features traditional blue stripes with a modernist twist- the stripes come in three colours! Sky blue, the blue of the Mediterranean Sea, and the blue between the midnight stars are found side by side at the edge of this shawl. The white shawl itself is made of wool, and suitable for most any weather (even for the seats by the shul’s AC vents!). The included kippah is made to match, with dark blue surrounded by a border of pale sky blue. Picking a tallit does not have to be tough. 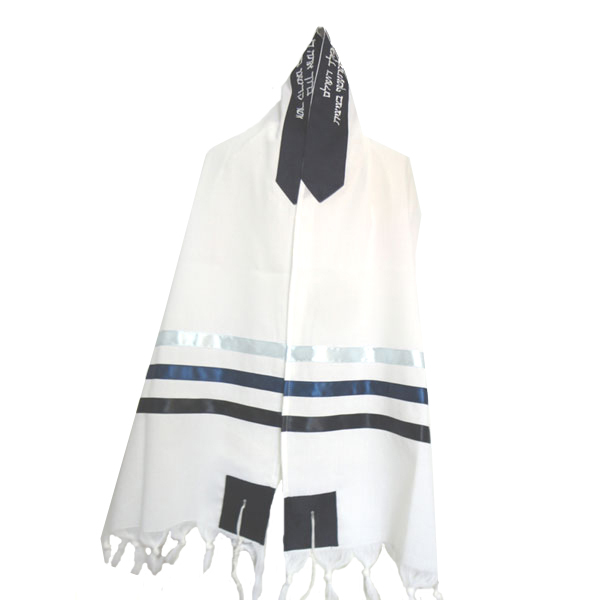 With traditional design, modern coloring, and quality material, this prayer shawl is a fine addition to anyone’s judaica collection and wardrobe.